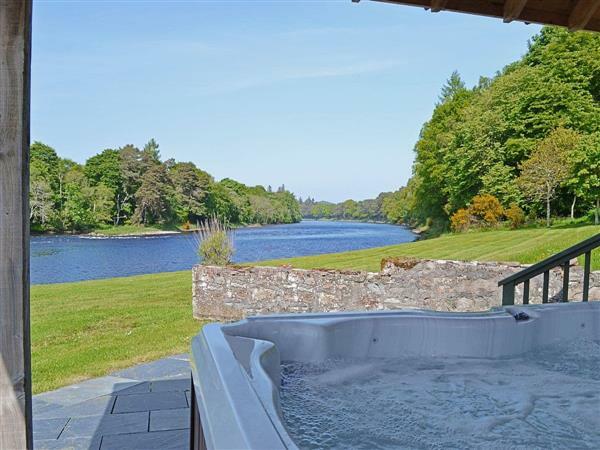 With a magnificent entrance, vaulted cathedral ceilings and double height window overlooking the river, this lodge is stunningly furnished in multicultural fashion. Large entrance hall. Spacious beamed living/dining room with open fire. Well-equipped kitchen with wooden floor. Library with 42 TV. Twin bedroom with TV, en-suite shower room with double cubicle, toilet and tiled floor. Cloakroom with two toilets and twin wash basin. First floor: Utility. Six double bedrooms, each with 6ft zip & link bed (can be twin) and TV; two with patio doors to balcony, and en-suite bathroom with over-bath shower and toilet, two with en-suite bathroom with over-bath shower and toilet, and two with en-suite shower room with double cubicle and toilet. For a better idea of where Ness Castle Estate - River Lodge is, you can see Ness Castle Estate - River Lodge on the map below. Do you want to holiday near Ness Castle Estate - River Lodge (SYYA), you can see other cottages within 25 miles of Ness Castle Estate - River Lodge; have a look to find your perfect holiday location. Eater Ross - Scottish Highlands.